A smartphone application is helping smallholders in sub-Saharan Africa and Latin America to collect data, share information on new agricultural practices and tackle climate change-related impacts. The application, called GeoFarmer, offers the possibility for farmers and agricultural practitioners to properly manage crops, farms, reduce risks in production while increasing productivity and eventually improve farmers’ livelihoods, according to a study published in the March issue of Computers and Electronics in Agriculture. "The idea is related to citizen science, where citizens, in our case farmers, can participate in the process of testing new practices together with experts or scientists," says Anton Eitzinger, a co-author of the study and a senior climate change scientist at the International Center for Tropical Agriculture, which helped develop the tool in collaboration with partners including the CGIAR Research programme of Climate Change, Agriculture and Food Security. Eitzinger adds that the rationale was to create a tool to stimulate a two-way communication between agricultural experts and farmers while testing new practices so that farmers can share their experiences, share it with experts but also with other farmers. The application features a free customisable survey tool that can collect information about situation analysis and a mapping tool to help users to upload pictures, audio messages or make comments. Researchers piloted the use of the application for data collection in Tanzania in 2014 to 2015 and used the lessons for further data collection in Uganda in 2016. Additional pilot tests were conducted in Colombia and Ghana in 2017. The study adds that the tool has an offline and synchronisation capability that facilitates data collection even if internet access is poor. For example, in Ghana, users of the tool collected more than 60,000 records from 356 farmers in two weeks with poor internet access. "We demonstrate that GeoFarmer is a cost-effective means of providing and sharing opportune indicators of on-farm performance," says the study. "It is a potentially useful tool that farmers and agricultural practitioners can use to manage their crops and farms better." Osana Bonilla-Findji, a co-author of the study and science officer of the CGIAR Research program of Climate Change, Agriculture and Food Security, says: "In the next version of GeoFarmer, the partners will include access to the results right away after finishing each survey in the application so that a farmer using the application will be in a position to have access to the overall results of the surveys." According to the researchers, the approach complements traditional methods of project monitoring by increasing the frequency of consulting key actors to understand the impact of interventions and provide timely information for action. 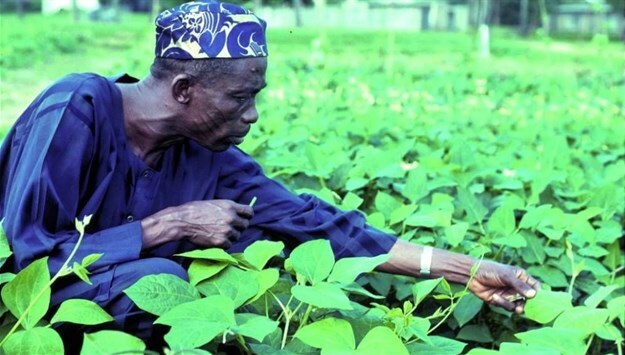 Prince Maxwell Etwire, a research scientist at Ghana’s Council for Scientific and Industrial Research, says that the use of information and communication technologies can help smallholders improve their farming practices and yields. Etwire recommends a need to boost uptake of applications such as GeoFarmer by smallholders through increased mobile phone coverage and improved use of information and communication technologies to provide client-specific advice. Samuel Hinneh is a freelance science journalist. He is one of the most prolific and consistent contributors for SciDev.Net. Hinneh has a great interest in developmental issues mainly focusing on food security, biodiversity, climate change and other environmental topics.